Doggy Talents Mod 1.12.2/1.11.2/1.10.2 is a fun based mod which teachers your dog some exciting tricks. Firstly it allows you to play with your dog and take care of them with various ways. Secondly you can also track your dog and dog leveling system. In addition to that there has been eighteen new features are added in the new version so check it out yourself. Furthermore the development progress is more than 80 percent complete. Moreover, by saying 80 we are saying that there are more features are on the way which will be included in the upcoming version. The 18 features are elaborated efficiently below and you can read them one by one. Minecraft client if this is first time using Forge. To change which Forge version to you’ll have to edit the “forge” profile. Now Doggy Talents Mod download button above, choose a version of the mod and download it. Wait 5 seconds and click “skip ad” in the top-right corner of the page. BlackPelt Doggy Talents: Improves critical hit rate, which increases damage by 50%. GuardDog Doggy Talents: Increases the chance that your dog will completely block a physical attack. HunterDog Doggy Talents: Every level grants a 10% chance to make anything your dog kills drop its loot twice. Level 5 grants an extra 10%, bringing it up to a 60% chance. HellHound: Lets your dog set things on fire with its attacks. The higher the level, the longer the fire lasts. Level 5 grants your dog immunity to all fire damage. PackPuppy: Each level gives your dog 3 inventory slots in its PackPuppy GUI. To open the GUI right click on your dog with a plank in hand! At level 5, your dog will also automatically pick up any nearby items if it has space in its inventory. PillowPaw: Every level lets your dog fall 3 more blocks before it starts taking damage. Mastering this skill makes your dog completely immune to fall damage, and also capable of floating/gliding when it jumps. ShepherdDogs: Put some wheat in your hand, and any trained ShepherdDogs will immediately rustle up some nearby livestock and carry them for you, making it easier to transport livestock long distances. This is quite tiring though, and costs a lot of nourishment (the cost is reduced with higher levels in the skill). To have your dog drop the animal, simply right-click on the dog. CreeperSweeper: A dog with this skill can smell creepers in the area, and if your dog isn’t sitting, it will growl to warn you. 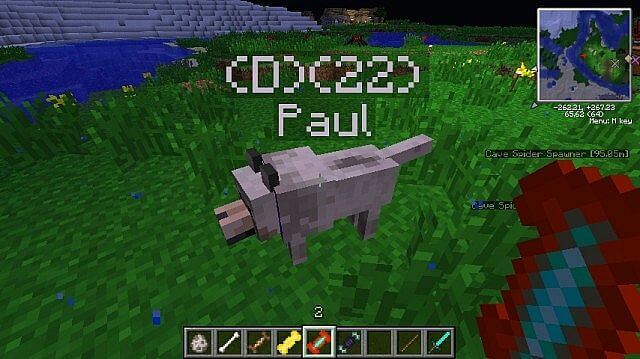 The range at which your dog can detect creepers increases by 6 blocks per level, and mastering this skill will make your dog capable of attacking creepers. 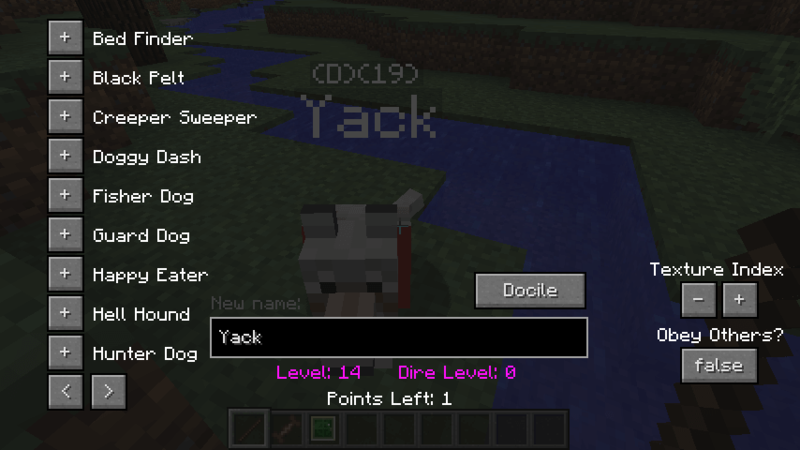 Your dog will reset the creeper’s detonation timer with each attack. DoggyDash: Increases your dog’s movement speed while chasing a target. Every level grants a 12% increase, and mastering it grants an additional 15% increase. FisherDog: Whenever your dog enters the water, it may catch a fish, which it will give to you when it shakes itself dry. The chance of catching a fish increases with level, and any points in HellHound may cause the fish to be pre-cooked. Mastering this skill lets your dog breathe underwater. HappyEater: Increases the NP your dog gets from food items by 10% per level. In addition, level 3 lets your dog eat rotten flesh, and level 5 lets your dog eat fish. BedFinder: While a dog with this skill is on your head, your bed will be highlighted in a black outline. To get the dog on you head right click on him with a bone in hand. The range at which it can do this is equal to 200 blocks per level, but becomes infinite at level 5. PestFighter: Inflicts 1 point of damage on all nearby silverfish at random. Increasing the skill level increases the range by 3 blocks, and mastering the skill doubles the damage. PoisonFang: Your dog’s attacks will poison their target, and the poison’s duration increases with level. 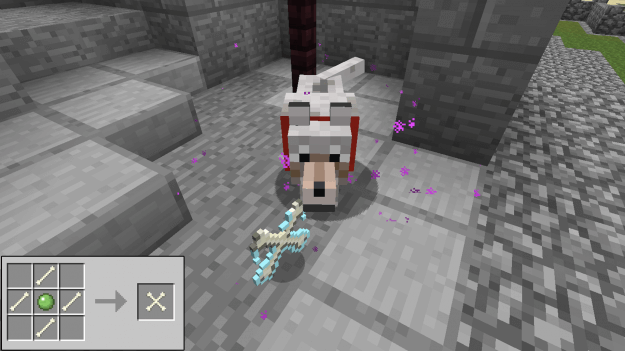 At level 3 your dog becomes immune to poison, and mastering this skill allows you to cleanse yourself of all potion effects, including poison, by right-clicking on your dog with a spider eye, at the cost of 30 NP. QuickHealer: Improves the rate at which your dog heals without needing to rest. Max this out and your dog will be able to heal 50% faster by sitting. RescueDog: If you’re at critical health and a dog with this skill is following you, it will attempt to heal you half a heart per level in this skill, at the cost of 100 NP. Mastering this skill reduces the cost to 80 NP. 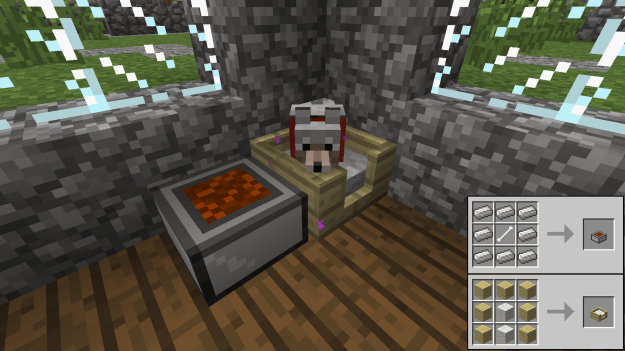 PuppyEyes: This skill will cause your dog to warm the heart of any villager, prompting the villager to give you presents! Higher levels in the skill increase the quality of the random gifts. This can only be done once every two Minecraft days. Mastering the skill allows you to do this once every Single Minecraft day. Wolf Mount: This allows you to ride your dog at speed around the land. To mount your dog jump and right click on the dog with nothing in your hand. With each level it also increases the height your dog can jump. Beware NP points drain faster while riding your dog. We would like to mention one thing that we strictly condemn the act of distributing the fake or broken links. The links are tested with malware bytes and popular antivirus so there is no need to be scared. Additionally if you find anything which is not related to the mods then please let us know via comment section so we can improve our quality.